What is Apatinib Mesylate used for? 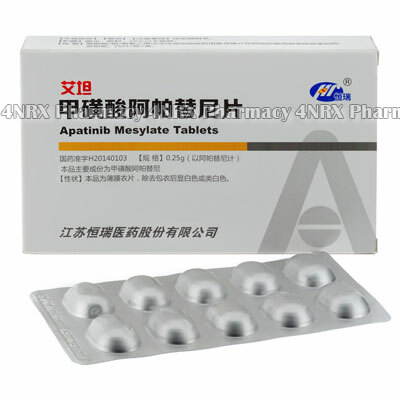 Apatinib mesylate is a target therapy medication, developed and manufactured in China. In 2014, the results of the randomized phase III clinical trial were presented. The research was held in China. The patients were receiving Apatinib mesylate as the third line of therapy - a small molecule tyrosine kinase inhibitor that selectively inhibits the vascular endothelial growth factor receptor-2 (VEGFR2). Compared to placebo, the medication has conclusively improved the survival index, with the acceptable tolerability levels. In the clinical trials, Apatinib mesylate shows promising anti-tumor activity against the wide range of malignant tumor. Apatinib mesylate is used to treat oncology patients suffering from various types of cancer, such as stomach cancer, lung cancer, liver cancer, and soft tissue sarcoma. How should I use Apatinib Mesylate? Apatinib mesylate tablets should only be used under the guidance of experienced doctors. Recommended dosage is 850 mg, taken once daily. The tablets are taken orally, half an hour after the meal with a glass of warm water. The tablets should be taken at the same time every day. What are the side effects of Apatinib Mesylate? Treatment with Apatinib mesylate is generally well tolerated. With regard to the adverse events, fatigue is the most common side effect among patients treated with Apatinib. Other common side effects consisted of low white blood cell counts, low platelet counts and toxicity to the skin know as hand-foot syndrome. Apatinib mesylate can be unsafe for certain patients. Apatinib mesylate must not be taken by patients, who are allergic or hyper sensitive to any components of the medication. Apatinib mesylate must not be taken by patients with contraindications (such as active bleeding, ulcers, intestinal perforation, intestinal obstruction, within 30 days after major surgery, uncontrolled high blood pressure medication, III-IV level cardiac insufficiency, severe liver and kidney dysfunction). The effect of the medication has not been studied in pregnant and lactating women. Please contact your physician for further clarifications.